A huge thanks to all the awesome staff and volunteers that made this happen. The young men of Pack 148 had a great time and the adults of Pack 148 appreciate your patience and dedication to our youth. Take a rest - you all deserve it! This was a great event and the program was top notch. Well planned and executed. Our troop thoroughly enjoyed it. Congratulations John on all your hard work putting together an amazing Camporee! Thank you for a very well organized, smooth event. I helped with the Cub Scout area and all went well. I was pleased to see fun and interesting activities that held the Scouts' interest all over the park. I had SO MUCH FUN!. Can't wait for the next big thing! Thanks for all of your hard work, as always! It's only as good as the leadership, so thank-you, John, for your dedication & commitment. CONGRATULATIONS to you as well John. Nice to be associated to someone who can actually think this big and pull it off. Especially doing it with such a high fun factor. I’m sure Big John would be proud of your efforts as well. This was a great event. Well planned and executed. Thanks to all staff and participants. John, Troop 655 had an Awesome time. Thank you for your time and team. Thank you to EVERYONE involved! The boys had an amazing weekend. Wish there was something sooner than 2016. A big thank you to John Ohlson for heading up another outstanding weekend of scouting fun! 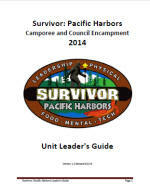 Over 1,000 scouts and Scouters enjoyed the Survivor Pacific Harbors Camporee, including many from our district! On behalf of the scouts and adult leaders of Troop 71 thanks for all of the hard work. This truly was a superb event. "We got back from WashJam today and Loved it!" "We had a fabulous time." "That was an OUTSTANDING event today. Thanks for the invitation. I saw so much interaction between the presenters and the scouts and my table was virtually non-stop." "My son and I were there Thur. thru Sat. and we both had a blast. It was our first jamboree to attend and we both plan on attending again in three years. Thanks again for a great experience..."
"Our son is a Webelo 1, and this is our first time at WashJam - we are very impressed! Everyone was very kind and upbeat, there was so much for our kids to do - we really liked that there were separate areas and that they could do more in the Boy Scout Area." "I took my sons (a Tiger and Webelo 2) and they both had a blast!! My Web has a very scientific thinking mind and I was pleased to see so much that he could feel involved in. Also, it exposed me to so many activities to do with the pack (bottle rockets and boffle were my sons faves). I am looking forward to the next Jam in four years!!" "Amazingly fun weekend! Thank you WashJam for all those who worked so hard to put this on...it was a weekend my son (Webelo II) will never forget! Can't wait for the next one." "Had a fabulous time as well. This event was well organized, wonderful activities for all ages, great stage productions, porta potties were cleaned and always well stocked, the activities were spread out so that you weren't crowded, and the vendors were great! Definitely will be attending the next one. Thanks for an enjoyable weekend. Highly recommended for all of you contemplating the next time." It sounds cool, and I can't wait! What should I do now? when new information is released. or multiple Scouts in a Unit.